Check out this beautiful used 58' Hatteras yacht for sale in Florida! 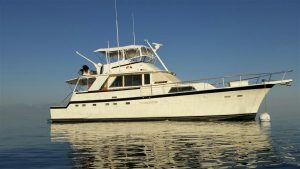 : Atlantic Yacht & Ship, Inc.
Word just came in from Bill Leonard that he has listed a great deal on a beautiful used 58′ Hatteras. This lovely yacht is located in Florida for easy viewing. Known as “Quest,” this beautiful used 58′ Hatteras yacht is an exceptionally nice fisherman. This yacht is propelled by twin 210 horse power Cummins diesel engines. Equally, they have been completed rebuilt to factory specifications with only 78 hours since rebuild. Overall, this is a very fuel efficient long-range cruiser with an approximate 1,200 mile range! Of course this solid used 58′ Hatteras has enjoyed many upgrades along her life making for a solid yacht. Recent upgrades int eh galley have created more cabinets and storage space. Furthermore, most of the interior lighting has been replaced to LED. Similarly, the master stateroom has had recent upgrades to the cabinetry as well. Correspondingly, one single bed was removed and a queen was installed. In a word, if you are in the market for a long-range-cruiser then this yacht is a “must see”! For more information on this beautiful used 58′ Hatteras yacht be sure to contact Bill Leonard today!